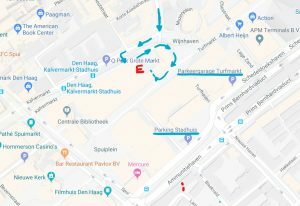 1) For vans and high vehicles which cannot access the Stadhuis car park underneath City Hall, deliveries can be made at the Forumplein or ‘back entrance’ of City Hall (that is the entrance nearest Centraal Station). This entrance will be open between 8:30 and 10:30 only. Cars can also access this door to deliver very large or heavy items which cannot be transported in the lifts. There is no parking at this point and vehicles must be moved away immediately after delivery. The parking wardens are very strict on this point. Park near to the Turfmarkt lift which will be opened especially for exhibitors from 8:30 to 10:30 and will come to the ground floor Exhibitor Hall. This sketch shows access to the Stadhuis car parks which is via Schedeldoeskshaven (as if driving from back end of Centraal Station where the bus station is towards the Filmhuis and Veenkade Car parks). Vehicle access to the delivery zone on Forum Plein (E) is from the front end of Centraal Station, past Museumplein parking towards Grote Markt Parking. Before Grote Markt follow the arrows to make a U turn and then follow the tram lines as if into the tunnel, but bearing right and passing around the white building and under the bridge to the delivery zone. 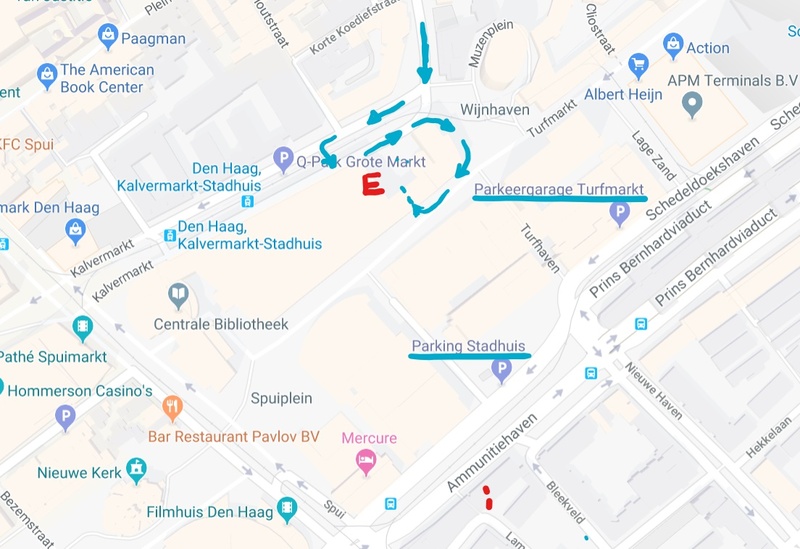 Exhibitors arriving during set up time between 8:30 and 10:30 can use the Exhibitor Entrance on Forumplein or from the Turfmarkt lift of the Stadhuis car park under City Hall and do not need a ticket or a pass. On arrival they should report to the Exhibitor Check-In Desk where they will be issued with a bracelet. Sports, Social & Community, supervised by ACCESS, next to the Turfmarkt Exhibitor entrance. Helpers, performers and presenters arriving after 11 o’clock will have to use the main Visitor Entrance and so should register for their Free Tickets here so that they can enter City Hall easily. You can apply to up to 4 tickets in a single registration and helpers can arrive independently with copies of the same multiple tickets.